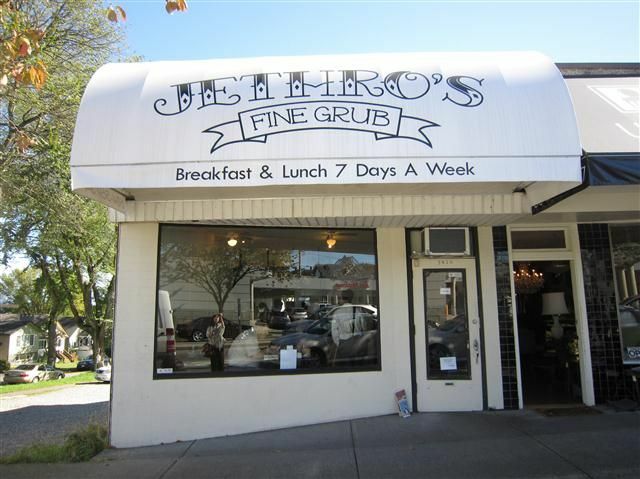 There's a restaurant that's infamous for its massive breakfast portions and that's Jethro's Fine Grub on Dunbar and 18th Avenue, and another location on Fraser Street. There are less than 30 seats in the Dunbar place, and the eatery doesn't take reservations so loyal fans are willing to stand outside and wait, and wait and wait. My friend and I arrived around 10am on Saturday and there was already a line there. We put our name down on the clipboard and waited for about 20 minutes before our name was called. To save time, my friend suggested I study the menu so that we could order as soon as we sat down. 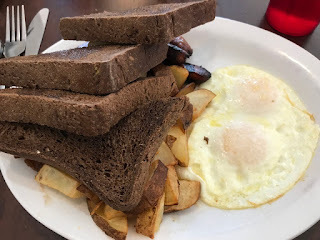 I chose two eggs and meat (CAD$10), with the eggs over easy and chorizo sausage with rye toast and hash browns. 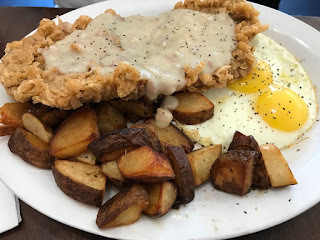 My companion picked chicken fried steak (CAD$15), that was battered then fried, topped with country gravy, hash browns, two eggs and toast. I suggested getting a side of pancakes to try, but when we sat down at our table, my friend told me to look to my right at the next table. 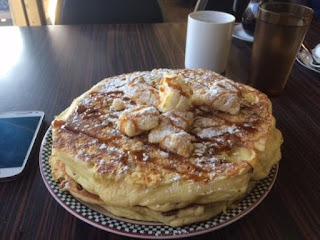 They had two pancakes (CAD$5) but they were as large as the plate itself! 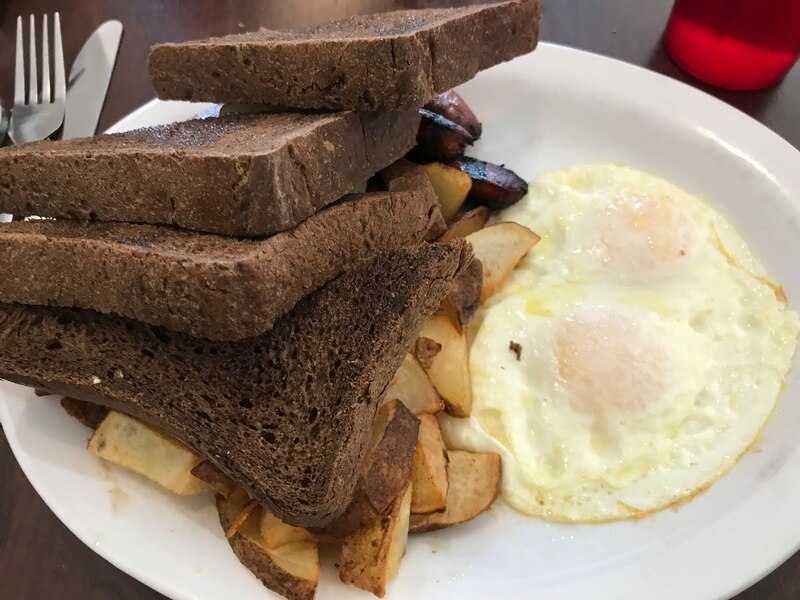 I decided it was better to be conservative and just try to finish my own breakfast order. Giant banana pecan caramel pancakes! When our food arrived, we had a mountain of food to tackle. It was definitely grub at a very reasonable price that filled you up quickly. I powered through, but in hindsight would have preferred smoked bacon or sausage instead of the chorizo that was very oily and spicy. Nevertheless, the giant plate of food hit the spot, and I got peanut butter to slather on my buttered rye toast. As for the chicken fried steak, my friend had no trouble devouring it and cleaned up her plate. The chicken had a delicious crunchy crust on the outside, tender inside. How she managed to eat the entire plate of food I don't know, but there was nothing left. The diners next to us with the giant pancakes had to pack the leftovers home, and many other customers did the same. You can't be too ambitious in this restaurant -- ordering too much could be the death of you. Afterwards we walked around downtown and still weren't hungry until dinnertime! Definitely fills you up for the whole day.